Cuchi Tunnel is one of the very special destinations of the world. It is a kind of a museum of war of humand kind. 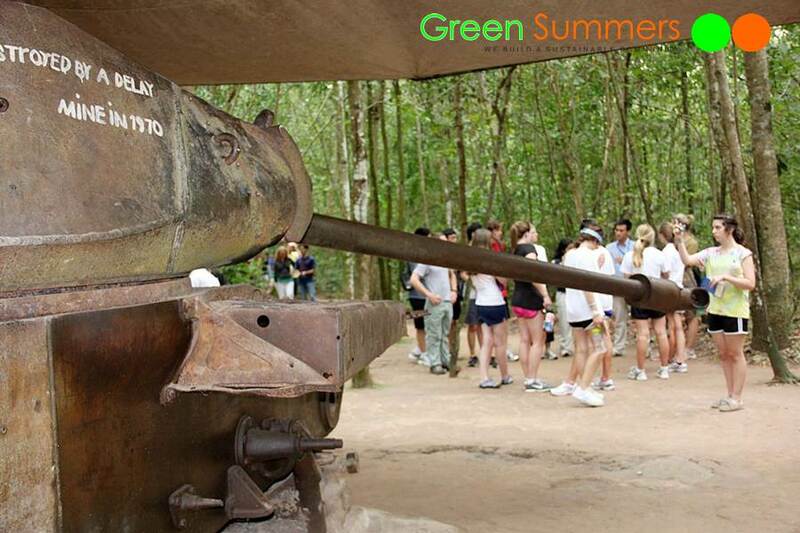 Our Vietnam school tours Cuchi Tunnel is then an opportunity for students to understand the guerrilla warfare techniques. 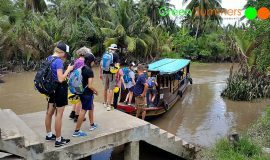 It helps students to imagine what happens at the war time, how the local people can live The extraordinary life in the tunnel is also a good comparison for students to their current happy life. We start the day from Saigon in an early morning. The local people Saigonese have been poured to streets by motorbikes to their working places. After an hour of driving, we have get out of the city center and enter into the green color of Cuchi. It’s not about rice farms. We have those in Cuchi but it’s not many. The land is too hard. It’s good for tunnel but not good for rice farms. The green color can come from vegetable farms or rubber plantations. 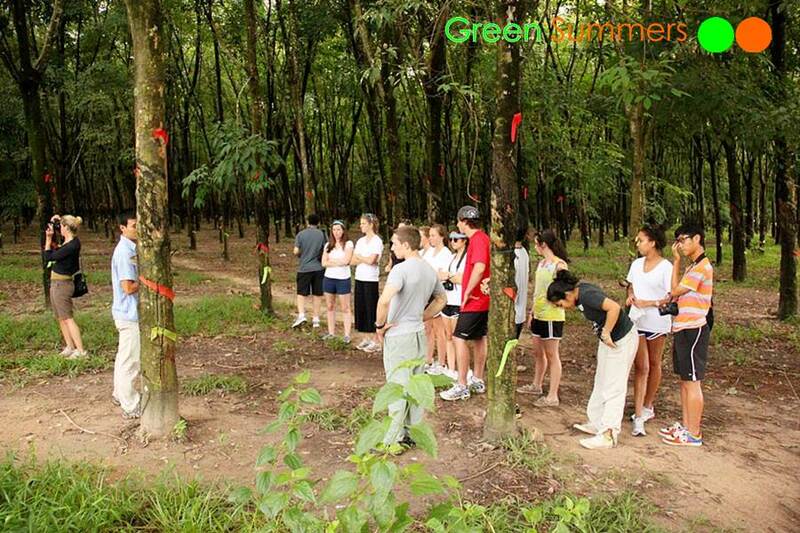 Our Vietnam school tours Cuchi Tunnel stops by a rubber plantation. 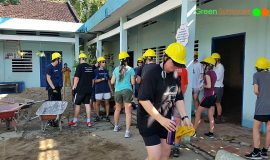 We follow our project leader to discover the stories of the rubber tree, how and when and why to collect the latex. We really have chance to touch the rubber tree knowledge at fields. In some days we also can meet workers collecting rubber latex and their working is amazing to see. 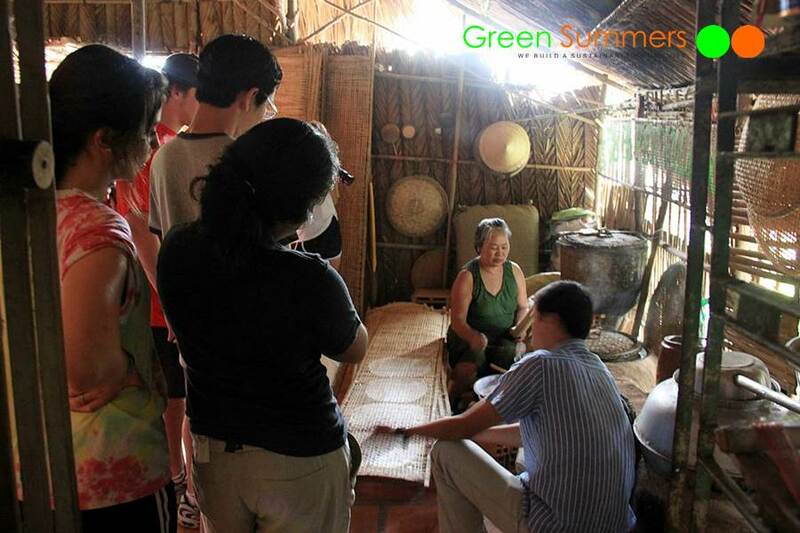 The next stop of Vietnam school tours Cuchi Tunnel is a local house where our project leader introduces us to the host. She makes rice papers to sell those to the village. The visit will make understanding that lasts long in the mind of students, especially when they come to an Asian restaurant later. 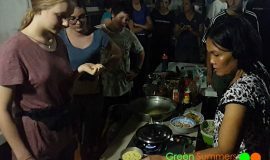 Some students even can try to make some rice papers for a great experience. 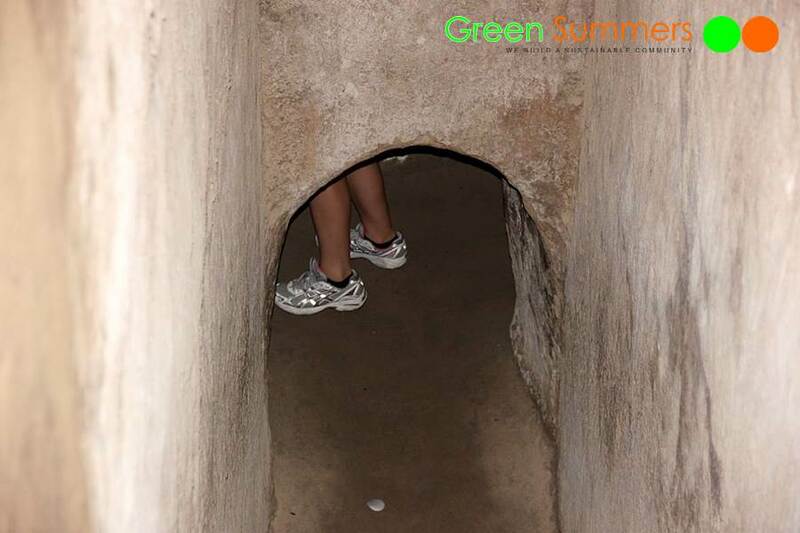 The main part of Vietnam school tours Cuchi Tunnel is the tunnel of course. We enter the site of the tunnel and watch a short document movie about life at tunnel long time ago. 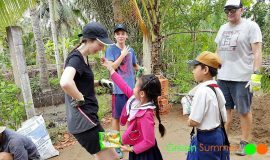 A miniature and a map are also available for the project leader to have some brief introduction about the Cuchi tunnel place. We walk around a while to see the tunnel history from outside. We see entrances with special camouflages; we see air ventilation systems; we see bunkers; we see shocked bamboo traps for guerrilla techniques; we see tanks on the ground which have been damaged and stopped there since then. That’s a thorough introduction of the tunnel. We come to another section of the trip by get into the tunnel and start crawling like a Cuchi man long time ago. You might be afraid of little space, of darkness, or unwanted dangers from the tunnel. 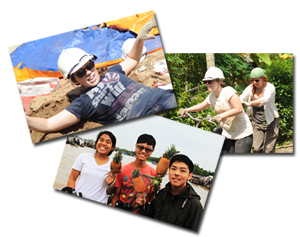 However, its is a special experience that you can’t not find it out where else. The more you crawl, the tunnel get smaller. You can crawl from meeting room to living room, further to under ground hospital or even to a hidden kitchen. Getting to know the special techniques for surgery at the war time is also amazing. Futher crawling can lead to some bottle neck that is design for Vietnamese bodies only. It’s small but it’s a very unique experience when we should crawl by our belly. Getting out of the fear in the small tunnel, we can visit the outside of the kitchen and understand how they hide smokes at cooking. What amazing ideas to survive. We sit down and enjoy some typical food of Cuchi men long time ago. We make some pictures of the Cuchi man display before getting to the bus. What a knowledgeable day! 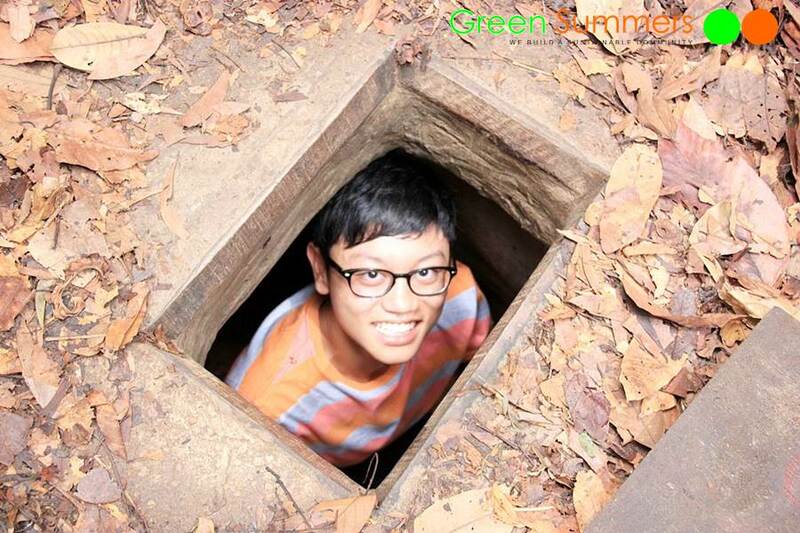 I’ve visited the Cuchi tunnels as well and found them amazing. I can’t believe they lived in those tight conditions for so long. I’m not a fan of small tunnels, which it appears you experienced as the day progressed. Looks like a fun day of learning and a great experience overall. What an interesting project. It gives good ideas how to protect yourself when everything around you is getting destroyed. This is so cool! I’ve been wanting to visit Vietnam for a long time. The war was obviously terrible but the tactics they used at the time have always intrigued. Thanks for letting me know about a tour company that provides such great insight into this!